What is it that attracts people to a ‘rare romantic piano concerto’? There must be something, or else Hyperion’s wonderful series, devoted exclusively to the genre would not have succeeded, with this particular issue being the 76th, no less. Speaking personally, I look for memorable tunes with the piano playing rather more than a primus inter pares role with the orchestra. As to which years the term ‘Romantic’ should apply, I settle for 1840-1940, with the bulk appearing across the middle of that range. I have started my review in this way, because the same question is posed in the booklet notes, and the writer makes no bones about the lack of memorable material in the three works on the disc. I’m inclined to disagree, at least as far as the first movement of the Rheinberger is concerned. It begins in a striking manner with three brief tutti outbursts. The fourth is extended into the entry of the piano which presents us with the quite striking main theme. This theme reappears several times in the movement, either from the piano or orchestra or both, sometimes in shortened form, and contributes a brazen ending for the movement. To my ears it is easily the most memorable component of the entire concerto. The second subject is softer, more lyrical, and like the first subject, reappears from then on in the movement. In some ways it is a pity that Rheinberger didn’t make a more extended use of the first theme, because as it is, a rather fragmented impression is given for most of the movement. Two short cadenzas are present, the first and slightly longer sounds like a Bach transplant, whilst the brief second is lusher. The second movement, an adagio, has a principal theme, which though pleasant, is hardly memorable, although Rheinberger tries to hold the listener’s interest by including some larger scale gestures. I often look to an ‘unheard’ concerto to make its impact through the slow movement, but I don’t think the composer really manages it here. The last movement achieves contrast by opening in leaping octaves (allegro energico) but a slow section follows leading to the final pages where the impressive main theme of the first movement is presented in (rather brief) grandeur. The remainder of this disc is devoted to two works by one Bernhardt Scholz, a native of Mainz. His music is of the Schumann-Brahms school, his concerto being in the repertoire of Clara Schumann, and he was one of the signatories (along with Brahms, Joachim and Grimm) of the 1860 ‘anti Music of the Future’ manifesto’ i.e. against that of the Lisztian New Weimar School. It seems that he worked tirelessly to promote Brahms’ music and himself composed a great deal of chamber music and no fewer than twenty organ sonatas. His music was accused of displaying “a certain academic approach and want of lively intensity of expression”. His piano concerto is a fairly lively affair, resembling Mendelssohn’s light-touch pianism, and there is plenty by way of virtuoso flourishes. That does not preclude an occasional weighty gesture, and the slow movement opens in a slightly bleaker manner, before proceeding in a conventional manner to a quiet close. The finale begins with dancing rhythms which give way to a rather introspective Brahmsian section, before reaching a less than exultant close. I found the work to be unmemorable and won’t be returning to it. The CD closes with his Capriccio for Piano and Orchestra. Again, Mendelssohn is brought to mind, as a quiet, rather nice reflective opening lasting about four minutes leads to the appearance of a jaunty idea that is designed to make listeners tap their feet. I don’t find it anywhere near as attractive as the quiet opening, though it does provide the brilliant component of its title. An oriental theme appears, accompanied by extended trills, and the piece hurtles to a busy, bouncing close. 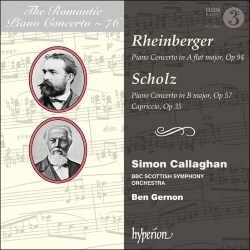 I don’t think that this is the best CD in Hyperion’s Romantic Piano Concerto series, just because none of the music is particularly memorable, although I am prepared to nod approvingly in the direction of the first movement of the Rheinberger and parts of the Capriccio. No criticism can be levelled at the pianist, conductor or orchestra, who all perform to the high standard set by the series, and the recording is excellent.